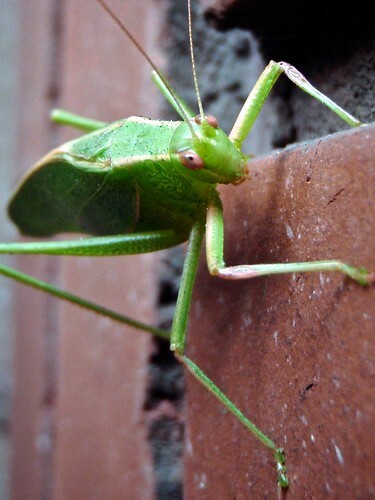 Grasshopper a photo by BaboMike on Flickr. Ah, the morning in Hobart. No idea what to use for a photo, but as usual, keep your eyes out, have a camera at the ready and something will always make itself found. In this case we have this delightful green giant, perched on a vertical brick wall just outside the staff entrance to the library. I’m actually really happy with the quality of this one considering it is from a small point and shoot camera and the guy was maybe 1 inch long in total. Rather happy with the end result.